Ocoee Middle School in Ocoee, FL partnered with Full Sail to create an inspirational music video to get students across the country excited about reading. This video was inspired by the Flash Mob Dance on the Oprah Winfrey Show performed by the Black Eyed Peas and several thousand of Oprah's fans. The video is about 5 minutes long. Oh -- the snowstorm scheduled to hit this area (on top of the 2 others) missed. It's hitting New York and north right now -- Watch Out Vermont, Here it comes! I'm Getting a Checkup by Marilyn Singer. Illustrated by David Milgrim. NY: Clarion Books, 2009. Available now. The award-winning poet, organizer of the annual Poetry Blast at the American Library Association summer conferences, and all-round nice person -- Marilyn Singer -- wrote a basic "going to the Doctor" book? And that illustrator -- David Milgrim? Didn't he write and illustrate all those wonderful easy-reading books about Otto the Robot? This is definately a book for parents and children to read together. 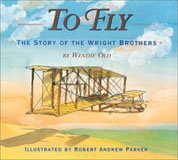 The poetry part on the page for the child to read and enjoy. The more involved paragraphs (in a different typeface and bold print either on the same or the facing page) for the adult to read to the child. Between the two, the book gives the child eader/ listener a good overview of what to expect at a "Well Baby" examination. A long explaination on the last page of the book explains things even more. Evidently, what our family calls a "Well Baby" examination is also called a Physical Examination or Getting a Checkup to make sure the child is healthy and developing normally. I love the fact that this book encourages the child and parent to ask questions if they are confused or curious. This book should be in the waiting room of every Doctor's office, and in would be useful in public libraries, especially in the PTC or Parent/ Teacher Collection. I don't think it's vital for a school library, but could be supplementary -- especiallly for those schools who are near a public health center. One thing of note -- the illustrations show a multicural variety of children and parents at the doctor's. Another good example of all kinds of people doing ordinary things. And did they cop out by only having white people on the cover? They DID NOT! Good for you David -- and Clarion. It's natural to feel a little nervous about going to the doctor. But this book's concrete and kid-friendly approach will put everyone's fears to rest. Join three children and their parents as they visit their pediatricians for a typical checkup, and learn all about the different tools doctors and nurses use. 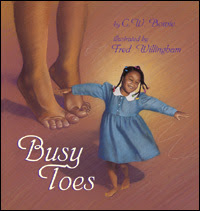 Upbeat illustrations featuring a diverse cast of characters are paired with a breezy rhymed text that reassures young readers--and their grownups--by guiding them through a physical examination step by step. Includes an author's note. More Nonfiction Monday posts can be found at Practically Paradise today. You've gotta go read this blog post by Meghan McCarthy over at the Blue Rose Girls. You know, the author/ illustrator of Seabiscuit Wonder Horse, Aliens are Coming!, Astronaut Handbook, etc., etc., etc. Once you read her message, do read all the wonderful comments. A huge discussion is happening there about talent. You know -- How to succeed in this crazy writing books business. Or shear persistence and learning the craft? The Best of Figure Skating by Kathy Allen. Mankato, MN: Capstone Press, 2010. The Best of Pro Sports series from the First Facts imprint. During the Olympics, what better book to check out than one giving you a quick background of some of the best moments in Figure Skating. The book varies between a double-page spread about one skater (or a pair) with sections discussing two different skaters. It's hard to summarise a skater's career in 5 sentences, but that's what this book attempts to do. Nice photographs, too. Glossary, three-book bibliography, and safe internet sites. More Nonfiction Monday posts can be found at The Art of Irreverence. Click and enjoy. Okay -- here's one writer's view of the history of the Internet. Being a writer is a lonely job. You sit all day staring at a blank piece of paper or a computer screen and try to capture in words the scenes playing out in your head. So that others can read it and imagine the same scenes -- the same stories. To keep sane, writers talk to other writers -- for advice and support. In the 1980s, I worked part time, and met with a critique group of people who wrote for children. I wrote newspaper articles on our electric typewriter. And then on our first computer, a Comodore 64. When I returned to work full time (kids going to college), I could no longer attend the critique group - it was 45 minutes away. Another one was an hour away. But my husband discovered the FIDOnet computer bulletin board where he could talk antique cars to a car group and hooked me up with a writer's group. Mostly Science Fiction writers, a few storytellers, a musician, and several artists. Every evening a new packet of messages arrived at the local computer bulletin board. The next day we would telephone his computer, download the part of the messages we wanted to read, respond to them and upload our responses to the computer bulletin board. Believe it or not, those message packets traveled all around the world, from computer to computer overnight and back to the computer bulletin board in Maryland. Yes, there even were writers from Austrailia. When FIDOnet died, I was invited by some Science Fiction writers to join GEnie. GEnie had been created by a group of Science Fiction writers who had negotiated the use of General Electric's computer system during the nighttime while GE was closed -- computer down time. Hurrah! 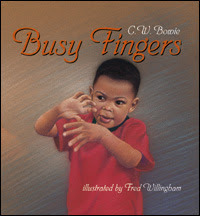 One of the writer's groups on it was children's book writers. At this time we were still using dial-up to the computer, but instead of downloading packets of information, like FIDOnet, we wrote on an online bulletin board at the GEnie site. Two years ago, I finally met Patricia Wrede in person -- a writer I'd been conversing with online since GEnie. She was so funny. She gave me a hug, but kept announcing to the people around us (mostly librarians) that she'd never met this person before. But that she has known me for over 15 years. When GEnie died (GE decided they needed to use their computers 24 hours a day), one of the GEnie writers, who happened to be the local SCBWI RA, invited me to switch to the AOL writer's boards. She and the other local RA became co-authors with me of the Busy books. (over to your right, here) We mushed our names together to come up with the pen name of C.W. Bowie. Then writers kept disappearing from the AOL boards and I discovered online Internet writer's groups, including a wonderful YAHOO Nonfiction Writer's group. There you go -- the history of the Internet, as seen by one of its users. We, my husband, the two 10-year olds, and I managed to shovel most of the 2 feet of snow out of the thousand-foot driveway. Except for that last bit. The four-foot wall of slush, now ice, pushed onto the end of the driveway by the street snow plow trucks remains. Here's hoping that we can remove that mess tomorrow morning. Even though my library will be closed and the 10-year-old's school will be closed on Monday, so far my husband's library has not announced what it's going to do. Open or stay closed. Which is why he's in a rush to get the driveway clear. Not so much, once the snow started. One manuscript almost whipped into shape. Several speaking contracts mailed (emailed) out. One speaking gig canceled because of Friday's snow. We got over 2 feet of snow. Many places in Maryland got more. We worked at clearing the snow most of the day. I stopped shoveling at sunset. I didn't feel too bad until I sat down and now every muscle and bone aches. My husband refused to stop plowing/ shoveling until .. well, until he stopped, because he was afraid he'd never move again after he stopped. But we still haven't reached the street. We plowed and shoveled the brick walk. He plowed 1/3rd of the driveway while I shoveled my way over to the cars and was able to partially dig out my husband's car. Mine is still under drifts of snow. He did part of the other third of the driveway and stopped. Now he has to figure out how to get snow off the last third, which is up hill and used to have a drop off where he would push snow, but the drop off is filled up with drifted snow. Tomorrow, I have to get out there and help him shovel the last third of the driveway to the street. I had a school visit scheduled for Friday, which was cancelled, where I was going to talk about research and revision. I have a family night program scheduled (in Washington, DC, about an hour and a half away) for Wednesday. It's possible that'll be cancelled, too. Another storm is forecast for then. Next, I have a Reading Association event scheduled Saturday the 20th. Guess what the predictions are for that weekend, too. 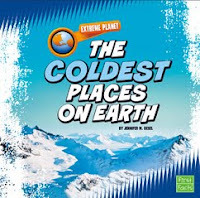 It used to be that we didn't schedule programs at the library in January because of Ice and snow -- but the seasons have slipped lately and it's Feb and March that seem to have the bad weather, not January. 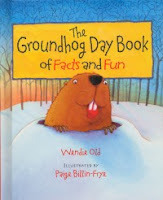 Click here to see Punxsutawney Phil's prediction. On the other hand -- other groundhogs disagree.